Through a masterful synthesis of music, movement and mysticism, Indian classical dancer Dr Methil Devika, explores the compelling allure of the serpent in her pioneering documentary short film ‘Sarpatatwam’ or the ‘Serpent Wisdom’. The unfurling serpent glides through mysterious spaces to transport its audience into the depths of the primordial. Devika, through the art form of Mohiniyattam, seeks to interpret the universal serpent philosophy propounded by an 11th century seer physician Pambatty (snake-charmer) Siddhar. During a recent visit to Kuwait to attend the annual dance event of Upasana, Dr Devika screened ‘Sarpatatwam’ in front of a select audience comprising dancers, dance students and media persons. Following the screening, she held an interactive session with the audience and spoke about why serpents are both feared and revered in many cultures. In various civilizations, not in India alone, for centuries, the serpent motif has always had religious connotations. However, contesting this claim, Devika argues that it is a ‘secret code’ and her documentary was an attempt at ‘unlocking this secret code’. “We can see this manifest in Chinese, Egyptian, or Greek civilizations. Even our medical symbol the Rhode of Asclepius is associated with serpent”, she pointed out. Interestingly, ‘Sarpatatwam’ or the Serpent Wisdom was premiered at the Valley Plaza Theatre in Los Angeles in September 2018 and was voted into the contention list for the Oscars making it the first Indian classical dance based documentary short film to hit the contention list. 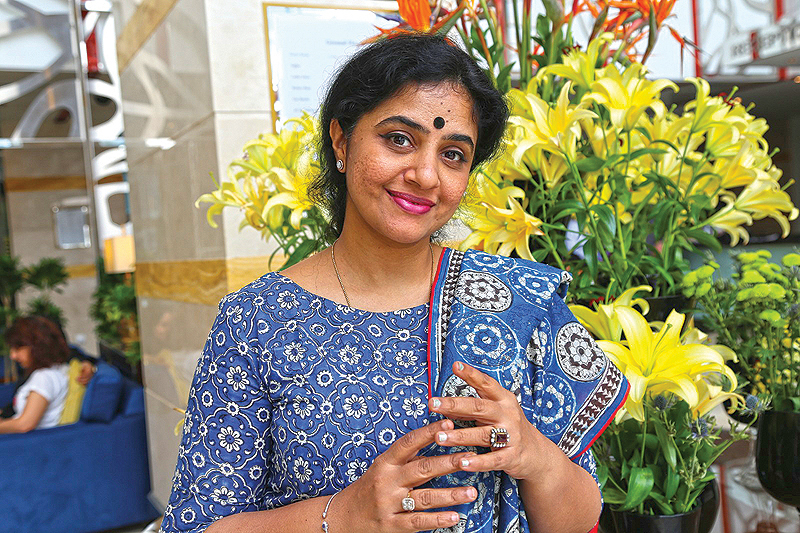 In an exclusive interview with the Kuwait Times, Dr Devika said she is using dance as a medium to outline the concept of serpent wisdom. “Here, the visual is me, it is my dance. Through this dance, in a very passive way, I seek to open out visuals in the minds of the audience. For instance, today morning I received several messages from people who watched the documentary said they could not sleep last night. So, the visuals begin when the documentary ends. That, precisely, is the whole connection it has with people,” she elaborated. According to Dr Devika, the documentary is not particularly disturbing, but rather is thought-provoking. “I spent several sleepless nights during the making of the documentary. In a way, whatever unrest I had during the making of it, I transfer it to the audience. So, I am glad if people had at least one sleepless night and it only means there was some sort of communication,” she quipped. A classical danseuse par excellence, Dr Devika uses Mohiniyattam as her medium. Making a breakthrough here, she seeks to liberate Mohiniyattam from its conventional confines, lending it a more contemporary appeal without diluting its classical purity. “I wanted to be true to the content. That was my purpose. I think I am most comfortable with dance in general and it comes naturally to me. Because I have the ability to adapt styles very fast,” she explained. She said dancers like Kamala Lakshman had choreographed the same song ‘Adupambe.’ “To me, those pieces appeared more like acrobatics. So, I took some of the hitherto unknown stanzas from the poem. Its lyrics had deeper layers of meanings and I wanted to tap the soul of these lyrics. And Mohiniyattom being my place of research, I knew it was the most suitable art form owing to its meditative quality. I knew it was the art form through which I could tap into the essence of the lyrics,” Dr Devika said. Elaborating further on the metaphysical connection, she said, “In human life, one evolves or transcends, either philosophically or physically, sometimes emotionally or spiritually. It covers all those layers just like a snake sheds its skin on a periodic basis. That is the underlying philosophy. Here I bring in the Kundalini aspect of yoga to explain the concept,” she added. Talking about the rationale behind documenting the work, she said, “I thought of archiving my works as a series. Incidentally, ‘Sarpatatwam’ was the first of the series,” she explained. Initially, Dr Devika wanted to put the documentary on the Youtube channel. “But when I finished the work, people like Adoor Gopalakrishnan advised me against uploading it on the Youtube. He told me if I did it, it would go off on a tangent. That is how it was premiered in Los Angeles. It became the first Indian classical dance to get voted into the contention list of the Oscars. Even the very growth of the documentary was serpentine,” she chuckled. Dr Devika has a master’s degree in Performing Arts from the Rabindra Bharati University with a first rank and gold medal. She completed her PhD in Mohiniyattam from Bharathidasan University as well. “In fact, the phenomenal success of this work is prompting me to do more works. In a larger sphere, the popularity or the significance of this work has become very pertinent in the sense that it is also a part of preserving our civilization,” she explained. “Dance is a part of our intangible heritage. Unfortunately, it is seen as mere entertainment today. When I use it as a medium to preserve other aspects of our heritage, other philosophies and our knowledge system, then the effect becomes manifold. That’s why I am sure this documentary has stood out and it is the first of its kind in live performance filming,” she said.